A gorgeous prairie - in no time flat! 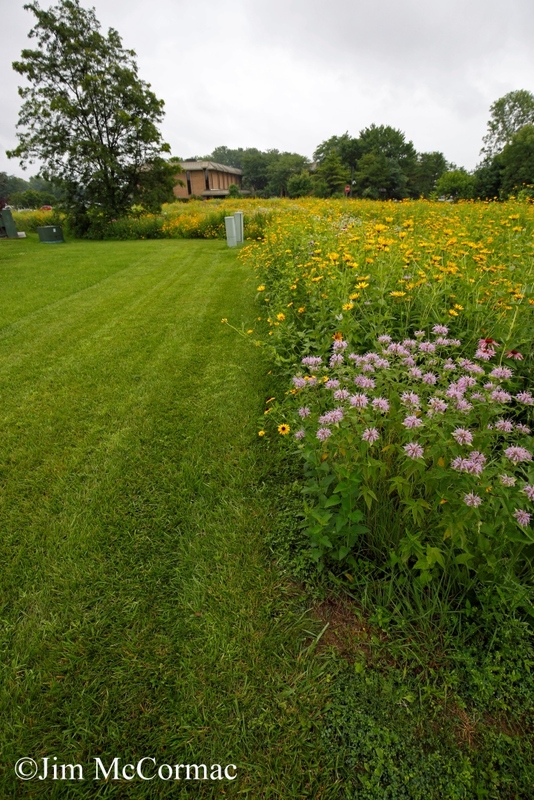 A lush prairie, teeming with colorful native wildflowers, stands in stark contrast to a lawn of empty emerald turf grass. In 2012, I had had quite enough of looking out my office window and gazing onto a field of turf grass. For those of us into biodiversity, few substrates short of cement or tarmac could be more boring. So, I acted. I caught the ear of the people who manage our complex and its grounds, and in relatively short order a meeting was convened. 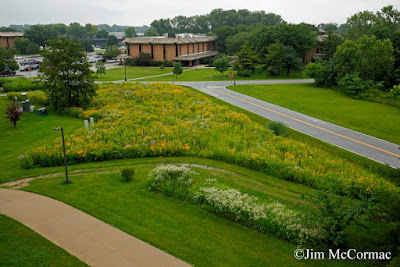 Aided and abetted by some like-minded friends who also work at our Ohio Department of Natural Resources central office complex, we laid out our case for botanical diversification. The powers-that-be were quite receptive, and now, at least on a third-acre or so, we have a vastly richer environment. I wrote a bit about this prairie's beginnings RIGHT HERE. I cannot thank the building and grounds managers enough for letting us act on this idea. 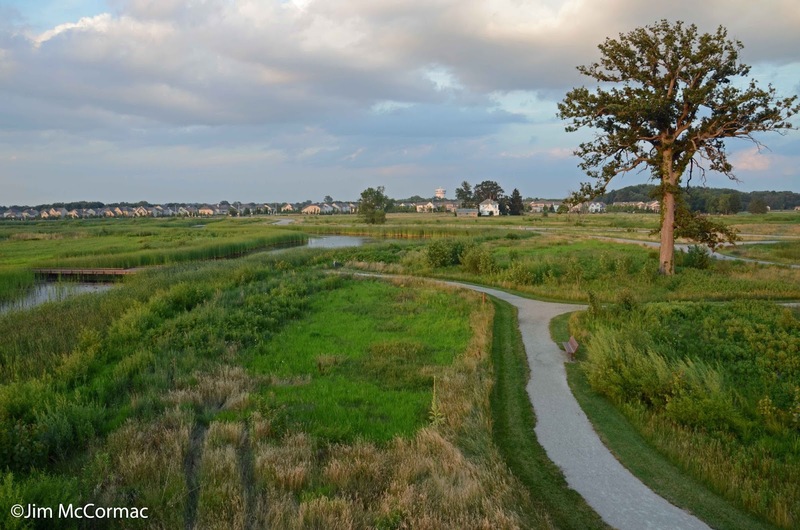 Bob Kehres at Ohio Prairie Nursery was integral to the project, both in providing expertise and seed sources. So, back in 2012 the entire area in the photo above was nothing but close-cropped turf grass. We planted in the spring of 2013, and saw results that very first year. 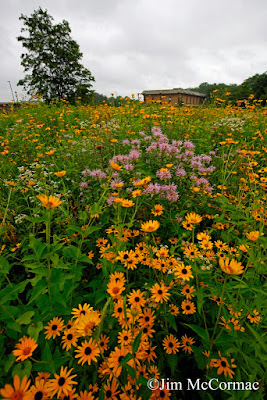 The fledgling prairie was sparser in its inaugural year, but lots of colorful annuals sprang forth, beautifying our creation. Last year was better. More plants of more species emerged, and the overall vegetation grew thicker. Things were looking good. I took the three photos in this post today, in between showers. I've been trying to thoroughly photo-document the prairie's progress, both in overall scope and in regards to the legions of insects and other animals that now use the site. The explosion of biodiversity has been fairly stupefying. To me eye, that colorful patchwork of prairie is far showier than the lawn that preceded it. And it's a lot less maintenance. No mowing required. The first two years, some weeding was necessary to control some weedy species that in many cases were probably in the seedbank. This year, the prairie's third growing season, the amount of undesirable nonnative plants was probably two-thirds reduced from last year. The tough prairie plants are taking hold and outcompeting them. Before long, maintenance will mostly consist of just mowing the site once in early spring, prior to the growing season, and not much more. Even though I've been there to watch our prairie mature, it still blows my mind that it could look like this in such short order. And it'll only get better. Both this year, and in the years to come. In general, prairies are at their showy best in July, so in the next few weeks it'll color up even more as more species come into bloom. As you might imagine, the flowering plant diversity attracts scores of pollinators and other interesting and valuable insects. An Indigo Bunting has even staked his claim on this prairie the past two years. We never had one stick around before. I should note that our office complex is in as urban an area of Columbus as one can find. If you read this blog, you'd probably be interested in doing something like this too. I'm sure some of you already have. Here's a great tip to jumpstart your venture into native flora: Visit the Midwest Native Plant Conference in Dayton, Ohio on Saturday, July 25th. An impressive array of plant vendors will be present, peddling the coolest native flora imaginable. CLICK HERE to find a list of just some of the species that will be for sale. All are welcome, and pass the word. If everyone planted a prairie, the world would inarguably be a better place. Were you seeking caterpillars, this wooded riparian corridor would be a great place to do so. Those of us that hunt caterpillars would likely follow in the footsteps of the birds, and search the foliage of streamside shrubs, trees, and various herbaceous growth. Who would think to wade on in, and check submerged rocks for caterpillars?! Here is the protagonist of this bizarre story, the showy little Two-banded Petrophila, Petrophila bifascialis. 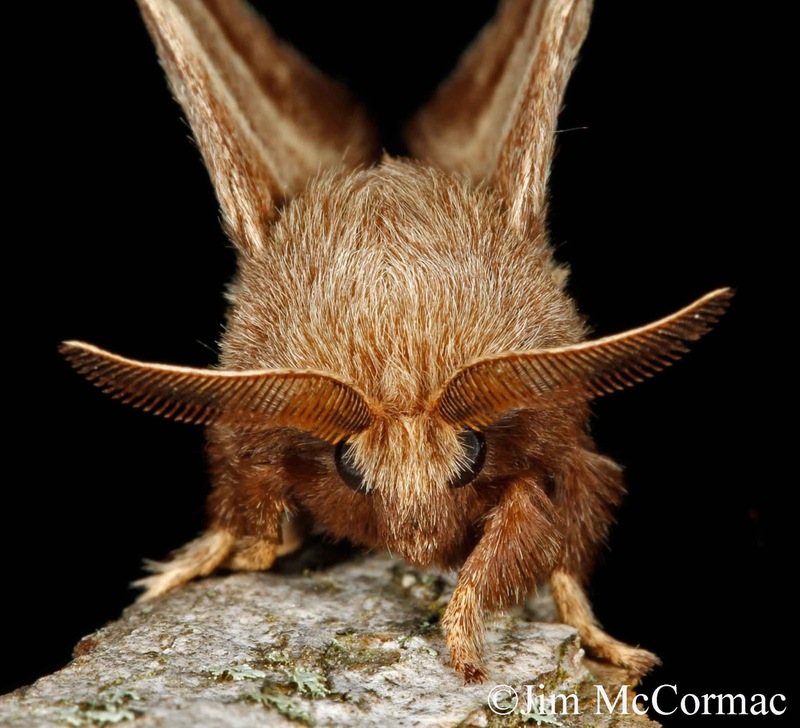 I first got turned onto these cool moths by David Wagner. He then astounded me by claiming that the moth is a jumping spider mimic! Yes, you read it right - a jumping spider mimic! The moth is not even the size of your thumbnail, so we're talking pretty dinky here. Note the summit of the hindwings. They glisten with small colorful dots. Seen from the right angle, especially from the rear, those can look remarkably similar to colorful spider eyes. But the real proof lies on the moth's mode of locomotion. 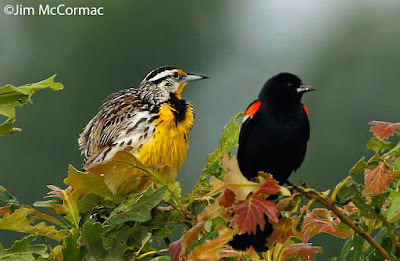 CLICK HERE for an amazing video of this species, taken in Ohio by David and Laura Hughes. Anyone familiar with the jerky rapid hopping gait of a jumping spider will quickly see the astonishing similarity in how the moth moves. 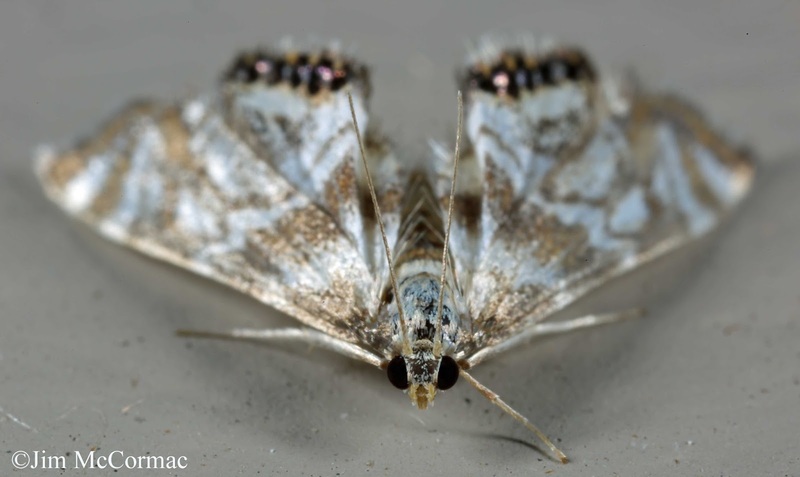 Other species of moths do the same, and the aforementioned David Wagner and colleagues proved that they actually are mimicking jumping spiders. In the following video, they've put a metalmark moth (one of the other spider mimic moths) in a box with a real jumping spider. The moth's movements and bold displays of its eyespots spook the spider into submission. CLICK HERE to see for yourself. Why would a moth evolve such a fabulous mimicry? No doubt because jumping spiders are voracious and abundant predators of small insects, including moths. If you rest on the upper surface of a leaf during the day, chances are good that sooner or later a patrolling jumper will come along and try to make a meal of you. But it's a lot less likely it actually will if you look like a bigger, badder jumper. Well, this tale gets even weirder. At the recent Mothapalooza, Laura Hughes was kind enough to bring along some of the caterpillars of the Two-banded Petrophila moth. Laura is an aquatic ecologist with the Ohio EPA, and spends much time in streams. She also knows more about aquatic entomology than anyone I have ever met. Anyway, I had asked her if she'd capture a few Petrophila larvae the next time she encountered some, and let me make photos. Voila! That's the beast above. While it may look large in the photo, it's really just a quarter-inch or so in length. 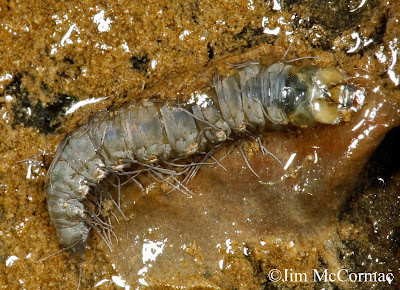 The Petrophila caterpillar spins a tubular silken case on the rock, which is submerged in the shallows, and rasps algae from the rock's surface. The threadlike hairs are not hairs at all - they are filamentous gills that allow the caterpillar to harvest oxygen from the water. Apparently the adult female moths will even dive into the water to deposit eggs on submerged rocks. While I'm sure there are underwater predators that occasionally take these caterpillars, they are certainly much safer from the legion of terrestrial predators such as birds, parasitoid wasps and flies, and other predatory insects. You just can't hardly make this stuff up. The view from the observation tower at Glacier Ridge Metropark, just west of Columbus. This, for me, is a local hotspot, being only 10-15 minutes from home, depending on traffic. But as is so often the case, I all too often shun local patches for places further afield and seemingly more exotic. Well, the deluges finally blew out last Saturday night and Sunday dawned with the promise of a dry day. I only had the morning to shoot, so what the heck thought I, I'll see what Glacier Ridge has to offer. A lot, as it turned out. I scarcely left the meadow I started in, and within two hours tallied about 55 species, including some goodies. Nearly the first bird out of the chute was a Blue Grosbeak, singing away. That's a rarity in my neck of the woods. A platoon of Bobolinks gurgled their R2-D2-like melodies, and the dry trill of a Grasshopper Sparrow added ambience. Competing Willow Flycatchers loudly upchucked their sneezy FITZ-BEWS! Row houses of bluebird condos sported lots of Tree Swallows, which constantly issued pleasing liquid gurgles, and of course the Eastern Bluebirds provided pleasant husky warbles. I threw the camera rig together, and stalked the perimeter of the meadow to see what I could photograph. 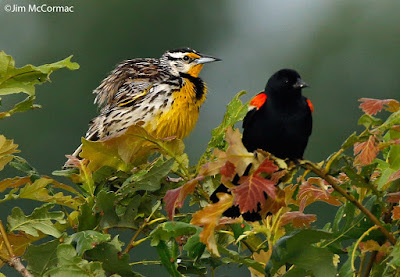 Before I even got out of the parking lot, my attention was drawn to the loud cheery whistles of an Eastern Meadowlark, teed up on an oak sapling. I greatly enjoy these quailish blackbirds, and began to move in his direction in the hope of obtaining some shots. Shortly after locking him in the Canon's sights, to my surprise a Red-winged Blackbird flew in and nearly landed on the lark. 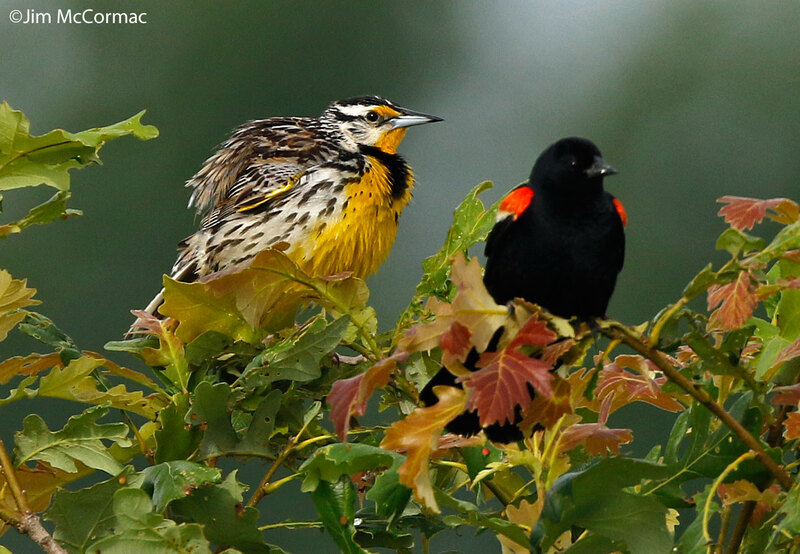 The shot above was taken right after the red-wing alit, and the meadowlark seems to be looking askance at the interloper. Best as I could tell, the red-wing was only a foot or so away from the meadowlark, and just behind it from my perspective. That's why I could only get decently sharp images of the lark, as that's where I wanted my focus to be. The meadowlark wasted no time in showing the red-wing who the king of the flutelike whistle is. While the lark had been singing before the blackbird arrived, its appearance seemed to prod him to greater musical heights. Senor red-wing listens, but does not seem impressed. 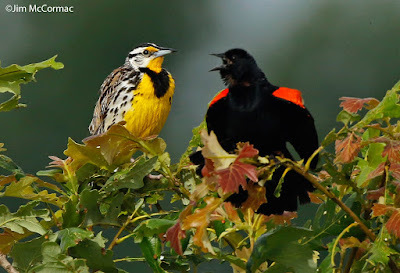 Once the lark clammed up, the red-wing puffed out his scarlet epaulets and let loose with a throaty CONK-AH-REE-ONK! It was as if he was telling lemon-boy who's the boss in this meadow. Well! That last red-wing aria seemed to ruffle the meadowlark's feathers a bit, and moments after I took this shot he fluttered from the tree. While the dueling blackbirds' performance didn't last long, I was glad to be there to enjoy the interaction. 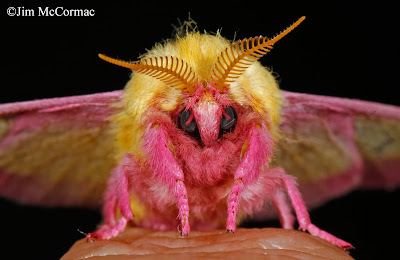 A Rosy Maple Moth, Dryocampa rubicunda, glares menacingly at your blogger. Well, as menacingly as a pink and yellow animal can manage. Our extreme mothing efforts at the recent Mothapalooza conference paid great dividends. Scads of species great and small were seen, and in most cases, photographed. I'll share a smattering of my efforts here. By the way, dates have been confirmed for Mothapalooza IV. 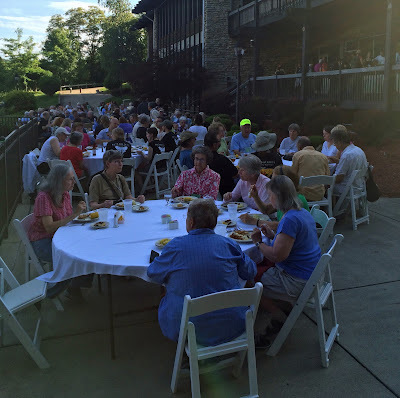 The conference will be back at Shawnee State Park Lodge, August 5 thru 7, 2016. The later date will provide a somewhat different cast of moth characters, and the crop of caterpillars will be much advanced. You won't want to miss it. The link to the Mothapalooza website is RIGHT HERE. This is one of our largest moths, the Royal Walnut Moth, Citheronia regalis. 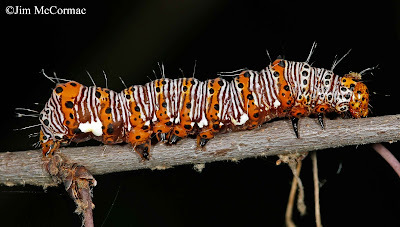 Its larva IS the biggest caterpillar, the fabled Hickory Horned Devil, which is nearly the size of a small hotdog. I have written about them HERE, and HERE. The giant silkmoths, such as this, always elicit oohs and aahs. 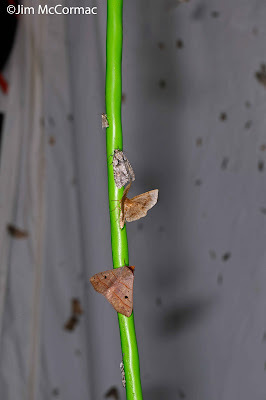 But cool as the jumbo silks are, one soon learns that many of the smaller - often MUCH smaller - moths best them in ornateness. An extravagant animal indeed, and its beauty is reflected in the name: Glorious Hybrosyne, Habrosyne gloriosa. One never seems to see many of these, but a few made their way to our sheets, generating lots of excitement. This one looks like an artist took a pen to its wings, and drew crazy op art. It's a Zebra Conchylodes, Conchylodes ovulalis. The subjects of this photo and the last were shot in situ; on the white illuminated sheets to which they were drawn. I refer to such backdrops as "white sheets of death" when it comes to making photographs, and only fire off shots under such conditions when I don't think there's any other way I'll get an image. In my view, it's impossible to get a really stunning photo on such substrates. We have discovered a nearly infallible rule to handling moths. If they're small and/or smooth, you cannot manipulate them. Touch one like this and its off like a rocket. However, the fuzzier and/or larger the moth, the easier they are to handle and move to better backdrops. Most of the following images' subjects were placed on nearby objects that provided for a much better image than a brightly lit white sheet. This little moth is truly fuzzy, as is its caterpillar. It's a Black-waved Flannel Moth, Lagoa crispata. The larva looks a bit like a turtle covered in brown shag carpet, and it can deliver a punishing sting via sting hairs. From a photographer's perspective, moths are fun to explore from different angles. Certain ones, such as this, lend themselves well to head-on views. Black-waved Flannels, like so many of the exceptionally fuzzy species, are usually quite easy to handle and move around. 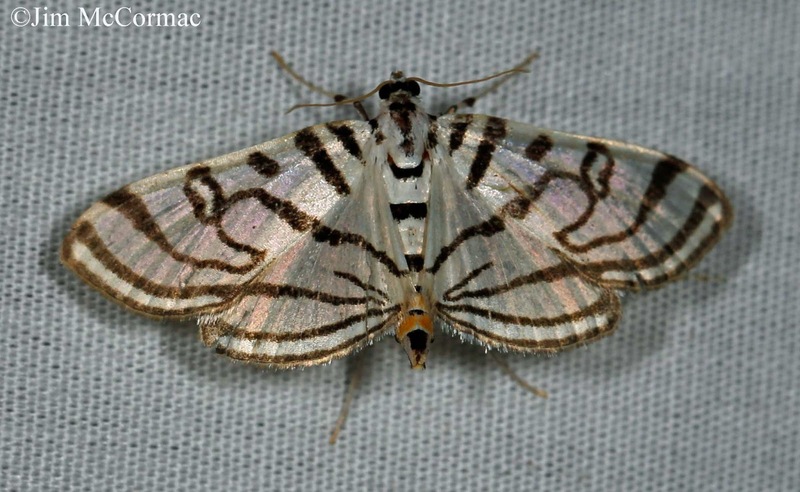 This Eastern Tent Caterpillar Moth, Malacosoma americanum, looks a bit like a charging bighorn sheep. In its larval stage, this moth is much derided. They're the caterpillars that form the large conspicuous silken nests on cherry trees in the spring. A Rose Hooktip, Oreta rosea, stunning in colors of lemon and peach. Their caterpillars feed on native viburnums such as Arrowwood, Viburnum dentatum. Ah! A personal favorite, and a stellar bark mimic if there ever was one (and there are lots)! It's a Common Lytrosis, Lytrosis unitaria, and it looks as if it was artfully carved from wood. Here we have camouflage taken to the ultimate. The sneakiest turkey hunter clad in the best ghillie suit couldn't hope to match this. It is a White-blotched Heterocampa, Heterocampa umbrata, and even though the moth fills the frame and the image is tack sharp, it is tough to see. Such cryptic coloration and patterning serves these moths well as they hide from birds and other predators during the day. 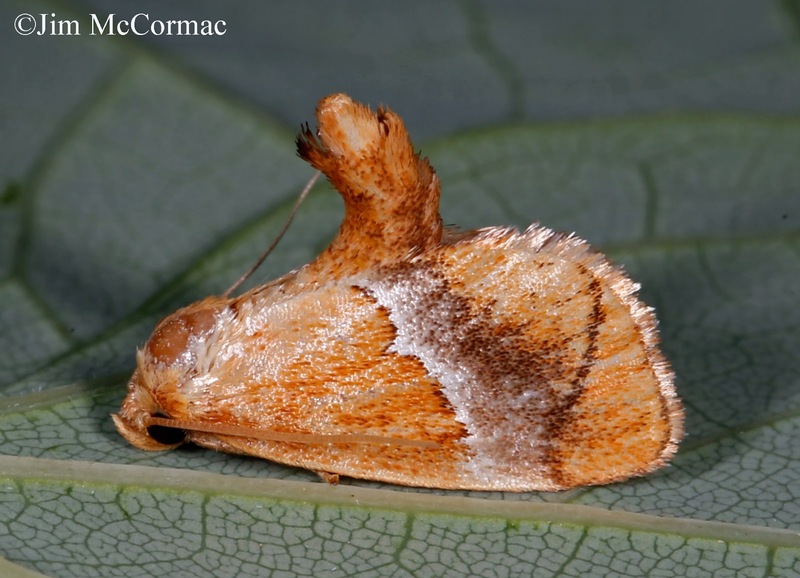 One that was new to me, the Small Necklace Moth, Hypsoropha hormos. 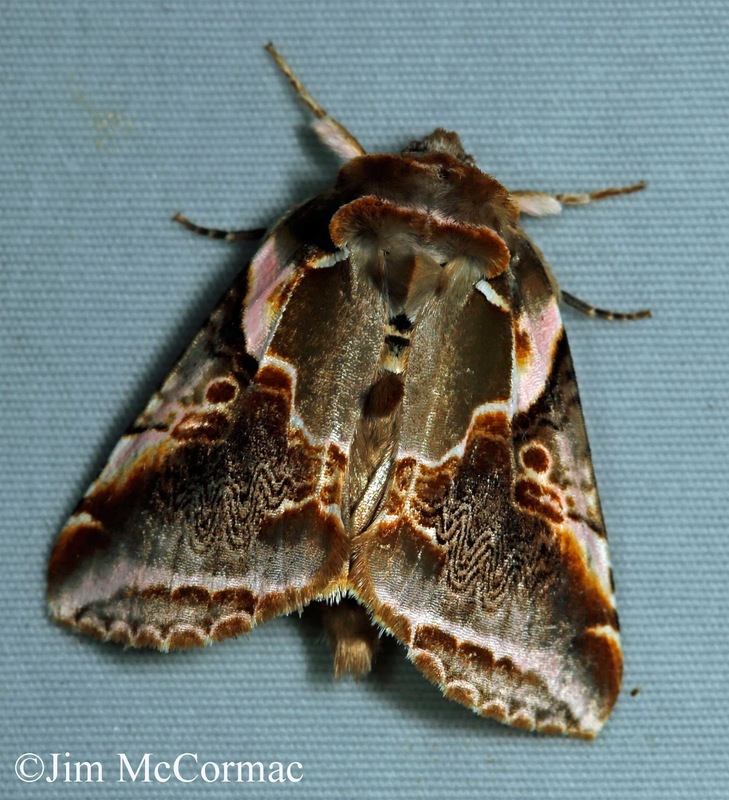 With some 2,500 moth species in Ohio, bagging lifers isn't too hard for most of us. Its caterpillar nosh on persimmon and sassafras. I had to violate my "white sheet of death" rule to make this image of a moth known as The Chevron, Eulithis testata. Being small and smooth, we would have had little chance of successfully relocating it. However, by getting my camera near the sheet and shooting sideways at the moth's level, it mitigated some of the sheet glare. 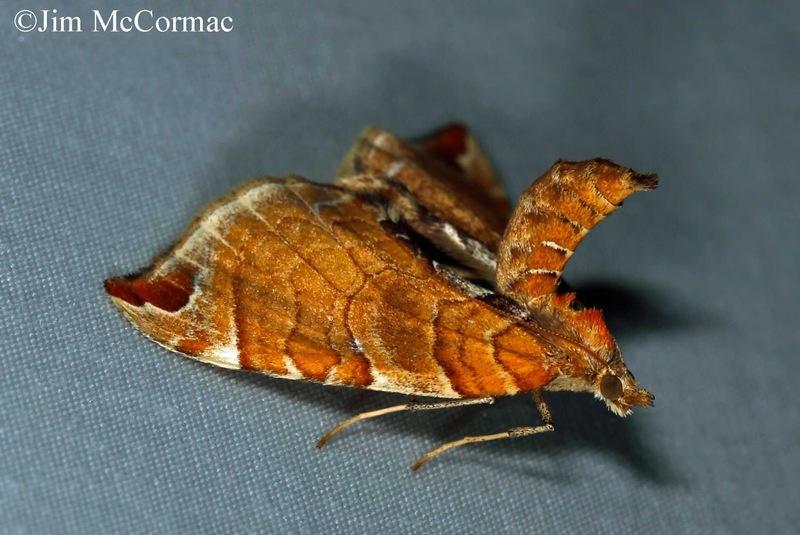 Note how the moth holds its abdomen arched up and over its head. 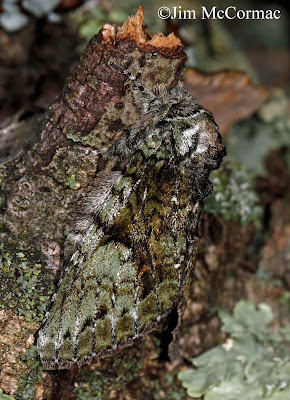 That's probably disruptive camouflage, helping it to blend in with the twigs and branches it probably hides on during the day. 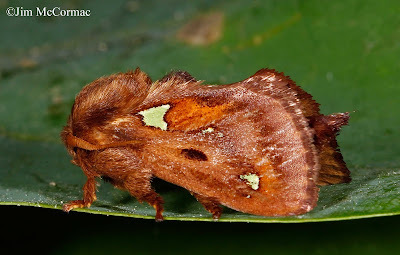 Many of us reminisced on good memories afield with Dennis Profant whenever we saw slug moths, which were probably his favorite group of Lepidopterans. 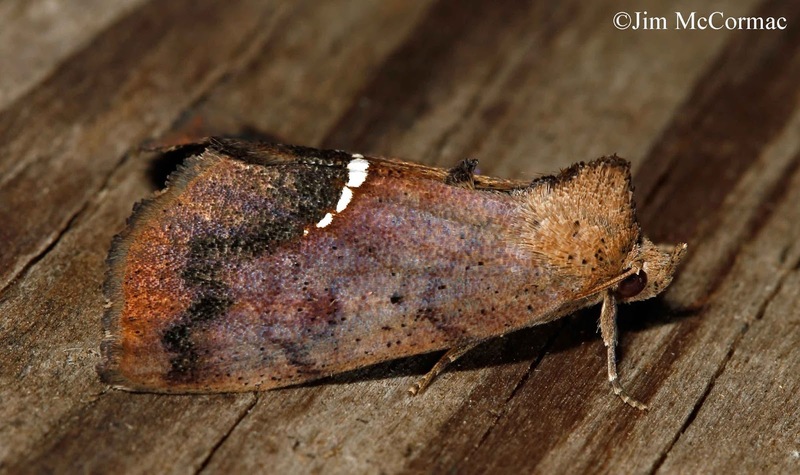 This one is a Spiny Oak Slug Moth, Euclea delphinii. Its caterpillar is incredible. CLICK HERE for a post that I made on slug moth caterpillars, which includes an image of this species' caterpillar. Finally, the strange little Yellow-shouldered Slug Moth, Lithacodes fasciola. It and most of its slug moth ilk are small enough to be overlooked among the comparative giants of the moth world. But one of the great pleasures of mothing is learning to pay close attention to the little guys, which often are the showiest animals on the sheet. Put Mothapalooza on your calendar for next year. If you like natural history in all its varied forms, you'll like Mothapalooza. The Tuliptree Silkmoth, Callosamia angulifera, is an impressive beast indeed, and attendees of the recent Mothapalooza conference saw many of them. And scores of other moths, of a great many species. As nearly all of the 175 or so conferees were armed with cameras, the total number of photos taken over the weekend was stupefying. I managed to click off a number of shots as well, and will share some of the mothian highlights in the next post. But for now, a pictorial recap of a few non-moth critters that were encountered. Butterfly milkweed, Asclepias tuberosa, bustles with Spicebush Swallowtails and Great Spangled Fritillaries. If you want a gorgeous plant that is highly attractive to the fluttery crowd, this is it. Butterfly milkweed was nearing peak bloom during Mothapalooza, and a number of the daytime field trips made a point of loitering near the plants and tallying lots of butterflies. Banded Hairstreaks, Satyrium calanus, were out in good numbers. Hairstreaks are thumbnail-sized bits of lepidpoteran magic, and sightings are highly coveted by butterfliers. This one was smitten with the turquoise shirt of a field tripper. Normally I prefer shooting subjects on natural substrates, but was struck by the color montage of the butterfly, the shirt, and the clear blue sky in the backdrop. Candice Talbot, a moth expert from Canada and one of our field station leaders, really wanted to see a black widow spider. It didn't take me long to find one for her. This is a female Northern Black Widow, Latrodectus variolus, guarding her egg case. It is a stunningly beautiful spider, and despite the widows' fearsome reputation, they have always struck me as retiring and passive. The ponds scattered throughout Shawnee State Forest typically have marshy verges and aquatic plants in the shallows, and can teem with damselflies and dragonflies. 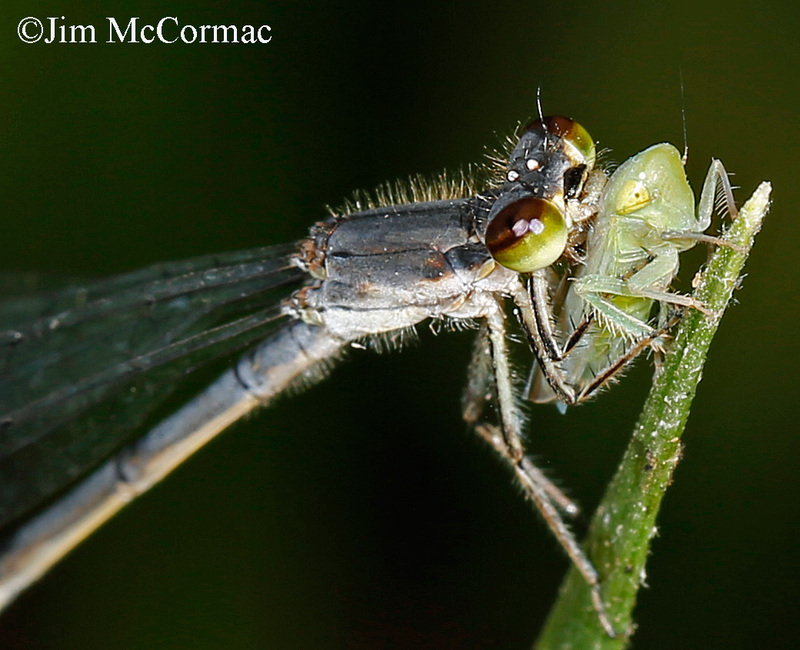 This is one of the tiniest of that crowd: A female Fragile Forktail, Ischnura posita. They are easily overlooked as they flutter through sedges and grasses, picking truly Lilliputian prey from the foliage. This one has captured a nymph of some sort of planthopper. The victim is so small that it couldn't be recognized at all with the naked eye. We all kept a sharp eye out for the larval stages of moths (and butterflies), the caterpillars. This extraordinary animal is an Eight-spotted Forester, Alypia octomaculata. It is one of many insects that requires plants in the grape family for nutrition. If all goes well, this caterpillar will become a showy black and white moth. Caterpillars face legions of enemies, few of them fiercer than this large beetle, the Fiery Searcher, Calosoma scrutator. These largely nocturnal beetles are large and speedy, and race about the trees seeking caterpillar victims, and other lesser insects. We had quite a few visit the mothing sheets, which is a double-edged sword. On the plus side, they are beautiful and not often seen. To the negative end, they sometimes eat the interesting moths lured to the sheet. At one point, a Fiery Searcher invaded one of our sheets, and unerringly navigated towards a moth known as a sack-bearer, the only one on the sheet and one of few seen during Mothapalooza. It then quickly made mincemeat of the sack-bearer. I'll devote the next post to moths, and only moths, that were observed during Mothapalooza. Mothapalooza III concludes, and it was grand! 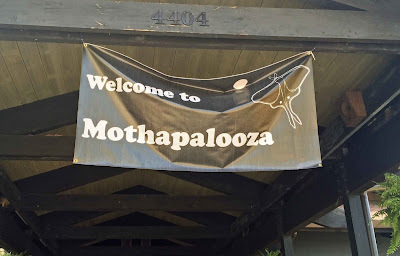 A giant banner strung across the entryway to the Shawnee State Park lodge in southern Ohio proclaims the arrival of Mothapalooza. It may also have scared off the non-moth'ers, or at least made them stare in befuddled wonderment, pondering whether they should enter the building. 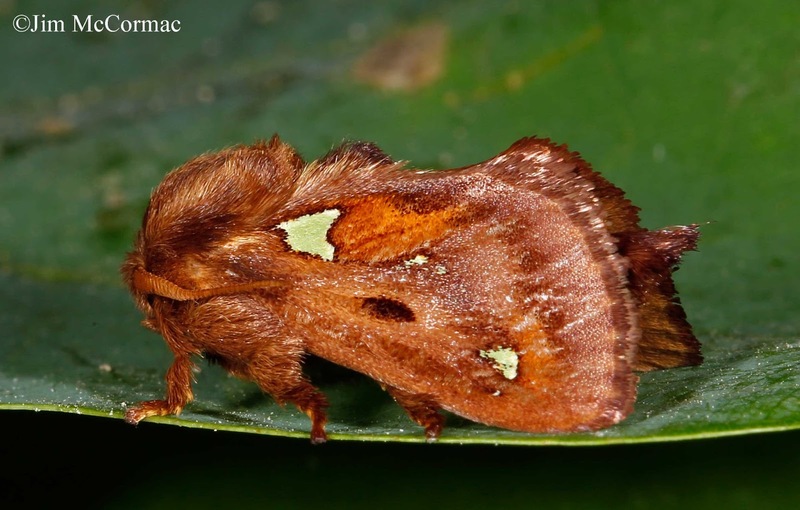 Mothapalooza is, insofar as we know, the largest and most complex event that celebrates the diversity and ornate complexity of the world of moths. A few of us hatched this scheme about four years ago, and we held Mothapalooza I in 2013. It, to our absolute amazement, drew about 140 attendees, plus a whole host of invited experts and guides. Mothapalooza II, held last year at Burr Oak State Park, was also a similar-sized sellout. Last weekend saw Mothapalooza back at Shawnee, and in total there were about 175 people. I think moth'ers from about eleven states were present. I can think of these offhand: Ohio, New York, Indiana, Missouri, Texas (yes, Texas! ), Kentucky, West Virginia, Delaware, Connecticut, Illinois, Pennsylvania and I'm sure I'm forgetting some. The common denominator was an interest - for many, a passion! - for the fluttery crowd. Mothapalooza's popularity is clear evidence of the interest in wildlife diversity, even forms of wildlife that are generally not thought of as drawing crowds. We, the organizers, are pleased by the local economic stimulus that such an event provides. We booked the entire resort for this - all rooms, all cabins, everything - and filled it. Many rooms were booked in nearby Portsmouth as well, to accommodate overflow. We rented lots of vehicles to shuttle participant's to field trip sites as well. We didn't attempt to track economic input from this weekend-long event but it certainly was into the tens of thousands of $$$. The moth crowd packs the lodge's back patio for the Saturday evening dinner. The logistics of organizing such an affair so that it runs smoothly is a ton of work. The Mothapalooza team included about 40 volunteers who orchestrated everything from transportation to vendors to field trips to speakers to lots of other things. Acting, quite ably I might add, as Mothapalooza CEO for the third year was Mary Ann Barnett. What great work she does, and anyone who has been involved in a large complex conference knows the skill set that is necessary to bring something like this off without hitches. I want to thank everyone who played any sort of role in helping. I hesitate to name names, as I'm certain to forget key people, as there are so many. But I will mention a few. Our Mothapalooza planning committee was Olivia Kittle, Judy Ganance, Elisabeth Rothschild, John Howard, Diane Brooks, Scott Hogsten. the aforementioned Mary Ann and myself. Most of us have been through the entire suite of Mothapaloozas and it's a great team. Thanks to everyone of them, and the crew of other volunteers who make Mothapalooza possible. I especially wish to thank our sponsors, and foremost among them was the Ohio Division of Wildlife. The DOW is certainly one of the leading natural resources agencies in the country when it comes to supporting wildlife diversity in all of its varied forms. CLICK HERE to see proof of this. 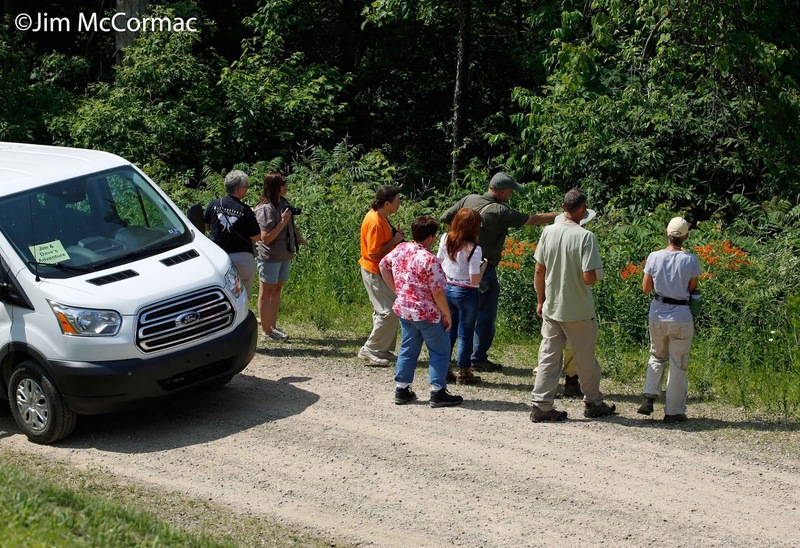 The other formal sponsors included the Cedar Bog Association, Crane Hollow Preserve, The Wild Ones, Ohio Lepidopterists, Midwest Native Plant Conference, National Wildlife Federation, Flora-Quest, National Moth Week, Ohio Prairie Nursery, and Monarch Pathways. The Ohio Chapter of The Nature Conservancy offered much support as did the Cincinnati Museum. They jointly own and manage the Edge of Appalachia Preserve, which played a big part in our field trip sites. Our Mothapalooza field trips are rather strange. Maybe not so much the Saturday daytime trips, one of which is shown above. The gentleman in the center, pointing with cap on, is none other than Dr. David Wagner, legendary entomologist at the University of Connecticut and author of the Caterpillars of Eastern North America. Dave's been to all of the Mothapaloozas and his presence greatly improves the event. This year, we had another piece of heavy artillery in the form of Dr. Douglas Tallamy of the University of Delaware. 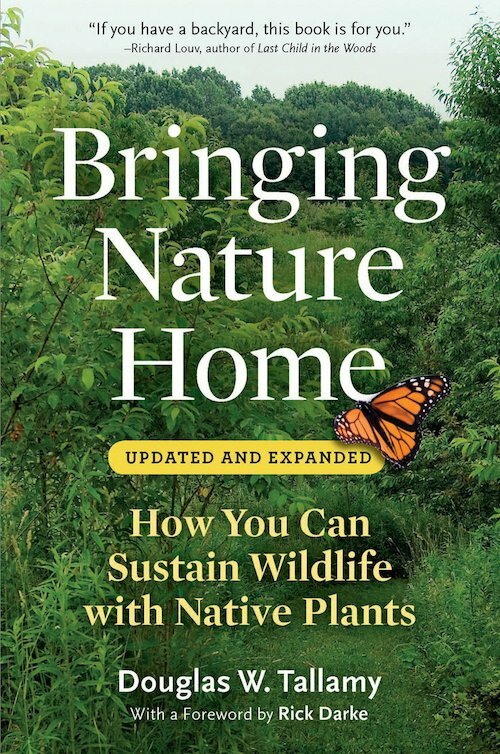 Doug is very well known in large part because of his ground-breaking book Bringing Nature Home. What a treat is was to have Dave and Doug as the evening keynote speakers. 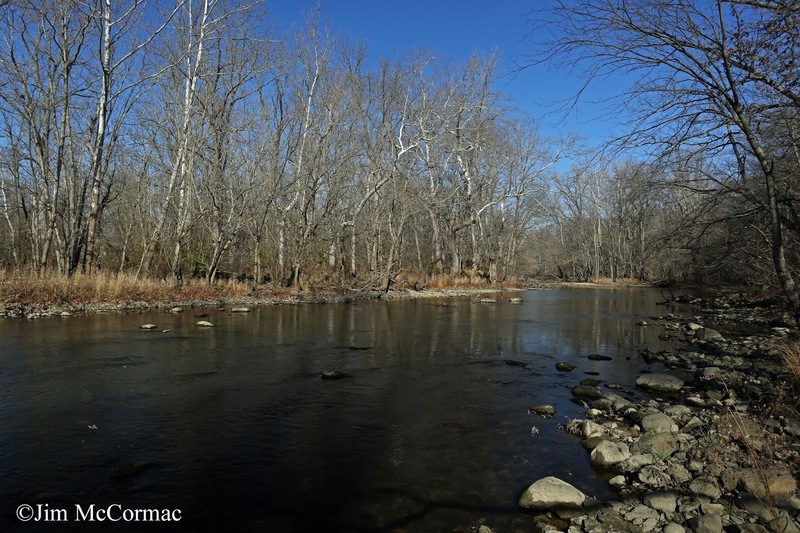 The Shawnee State Forest and nearby Edge of Appalachia Preserve is a region lush in diversity of flora and fauna. We found lots of it. Eight or so trips radiated out through the region, visiting all manner of habitats and locating scores of interesting things. But these daytime trips did not commence until 10 am - quite tardy indeed for veteran explorers of nature! But we had a good excuse for sleeping in. Our nocturnal mothing forays did not begin until nearly 10 pm, and most people did not return from those until 2 or 3 am, with some fanatics staying out later than that! Mothapalooza raises funds to give back to nature, usually to a group such as The Nature Conservancy. We want to support land acquisition, which is one of the highest and greatest things that anyone interested in the environment can help with. But this year, we deviated from that mission and instead gave $5000.00 to the newly established Dennis Profant Scholarship Fund, administered by Hocking College. Dennis was a topnotch biologist, a bona fide moth authority, and big supporter of Mothapalooza. His passing last April was tragic and far too soon. I wrote about Dennis RIGHT HERE. 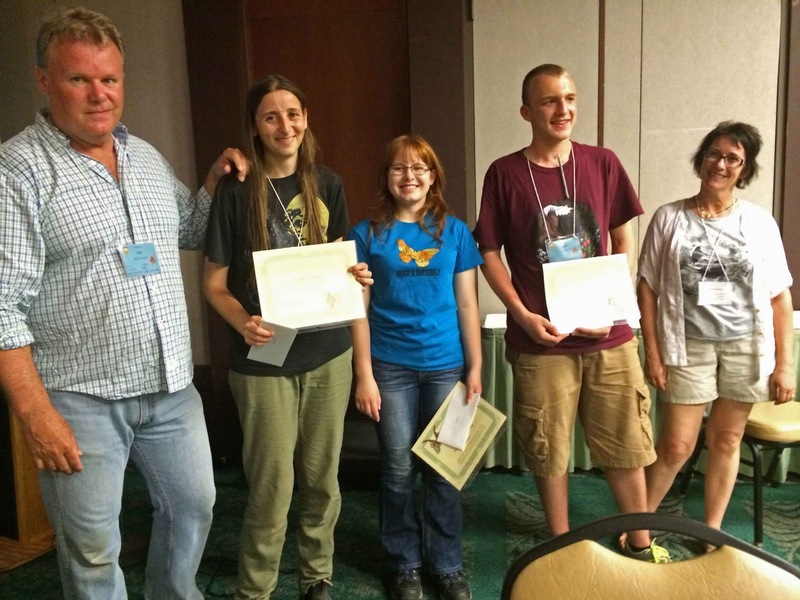 We also funded three outstanding young luminaries in the field of natural history to attend Mothapalooza. Your narrator and Mary Ann Barnett bookend (from left) Candice Talbot from Ontario, Canada; Alexandra Forsythe from Indiana; and Jacob Gorneau from New York. All are brilliant, passionate, and totally committed to natural history, and we hope to have a long relationship with each. If only they could be cloned and spread about the world. The primary field trips took place under cover of darkness. We are fortunate to have some of the greatest lepidopteran experts in the area working with us, and setting up lighted moth sheets far and wide. Mothing stations were scattered around Shawnee, and several were near the Eulett Center at the Edge of Appalachia Preserve. 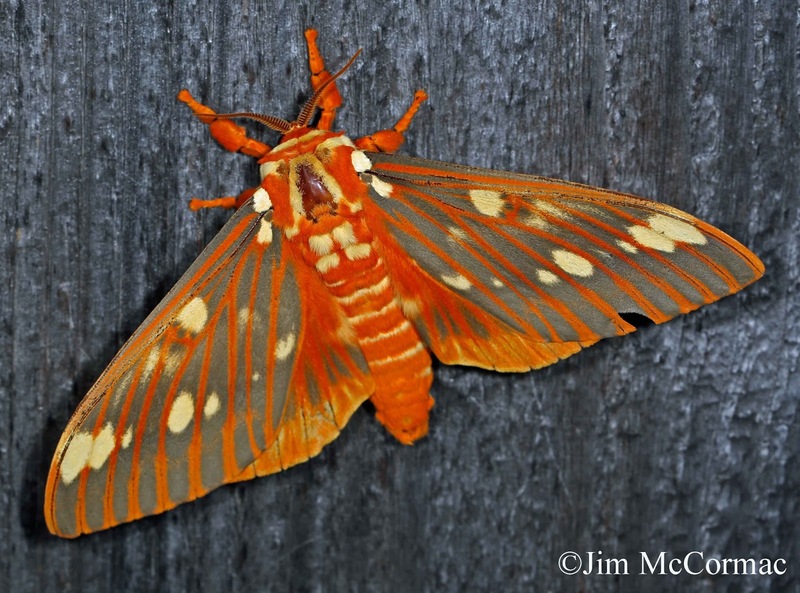 Mid-June is a spectacular time for moth abundance and diversity and we hit it out of the park this weekend. Or I should say, the moths did. Incredible numbers came to most mothing stations; so many in fact that moths were landing on any available surface near the sphere of lights, including wires, trees, tripods, and people. This short video, taken with the I-Phone's cool slo-mo video feature, offers a glimpse into the action around a moth-packed sheet. By sheer luck, a moth flies into the camera's field and across the video as I panned, creating a strange effect. 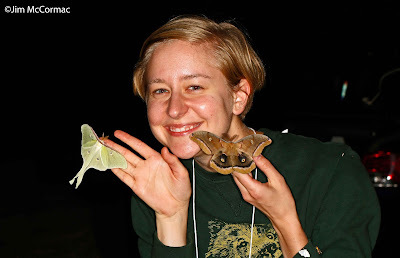 Becky Dennis poses with two of the giant silkmoths, a Luna on the left, and a Polyphemus on the right. 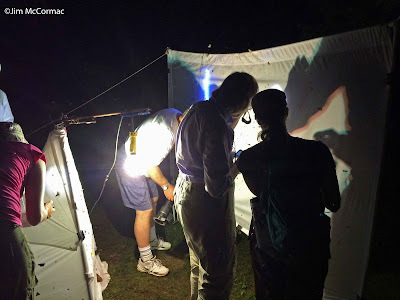 The big silkmoths are always crowd-pleasers and we had lots of them this year, of a dozen or so species. Tons of sphinx moths as well, and scores of other exotic insects. In my next post, I'll share some of the cool creatures that we ran across during Mothapalooza III. On March 17, 2013, The Dispatch ran a story describing the initiation of an American kestrel nest-box trail. The kestrel, our smallest falcon, requires cavities for nest sites, and suitable homes have become scarce for the charismatic birds. In 2012, 25 boxes were placed on road signs along state highways in Crawford and Wyandot counties — a region that’s part of the Sandusky Plains prairie, whose wide roadside verges and large adjacent meadows create abundant hunting habitat for the falcons. The results of the inaugural season were encouraging: Eight kestrel chicks were fledged in 2013. Before spring 2014, 16 more boxes were added for a total of 41 kestrel condos. The number of fledged kestrels almost tripled last year, with 22 birds produced. Road construction has deterred some nesting this year, but 13 chicks have been produced, with eggs still to hatch in two other nests. American kestrel populations in eastern North America have plummeted by almost half during the past 50 years. 40 percent since 1990. The earliest reporters, such as Lawrence Hicks in 1935, said there were more kestrels than all other raptors combined. 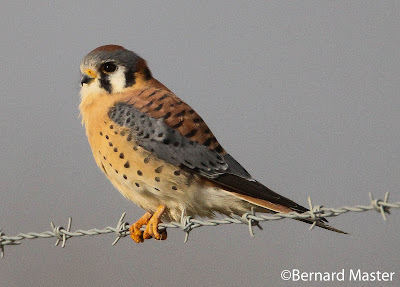 Kestrels might be only the size of a blue jay, but they’re death for mice and large grasshoppers. They often hunt from telephone wires, scanning the ground for prey. Sometimes they’ll “wind kite,” hovering as if tethered to a string. Several factors — including reduced habitat because of large-scale landscape changes and decreases in prey because of pesticides — probably have contributed to the kestrel declines. Populations of larger Cooper’s hawks have hurt, too: They’re known to prey on kestrels. Kestrels must also vie with starlings for cavities. A reduction in cavity nest sites might be the biggest pinch point, but kestrels take readily to man-made boxes. Amanda Duren of the Ohio Bird Conservation Initiative spearheaded the kestrel nest-box trail with support from the Ohio Division of Wildlife, the American Kestrel Partnership and the Ohio Ornithological Society. Charlie Zepp of Dublin built most of the original boxes, and students at the University of Findlay and volunteers with the Crawford County Park District are monitoring the nests. Most importantly, Matt Perlik and Matt Raymond — biologists from the Ohio Department of Transportation — embraced the kestrel project, paving the way for the placement of nest boxes. With luck, the Ohio Kestrel Partnership will keep the little falcons a part of the roadside scenery for a long time. 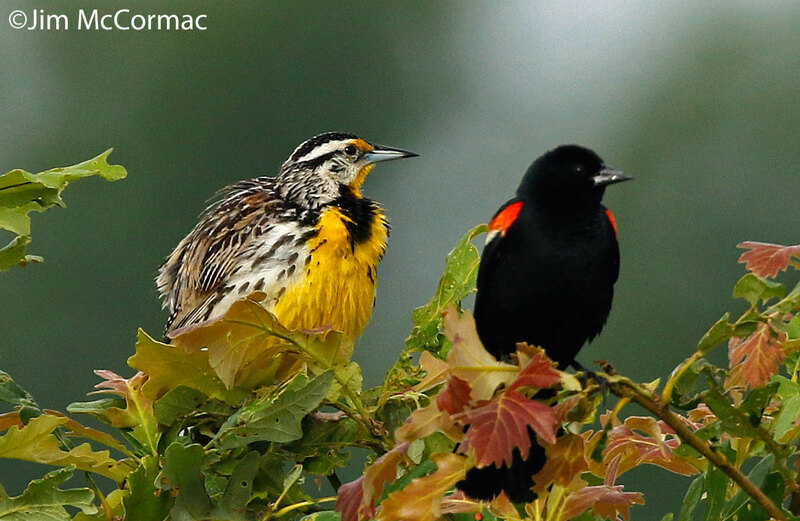 Naturalist Jim McCormac writes a column for The Dispatch at least twice a month. He also writes about nature at www.jimmccormac. blogspot.com. 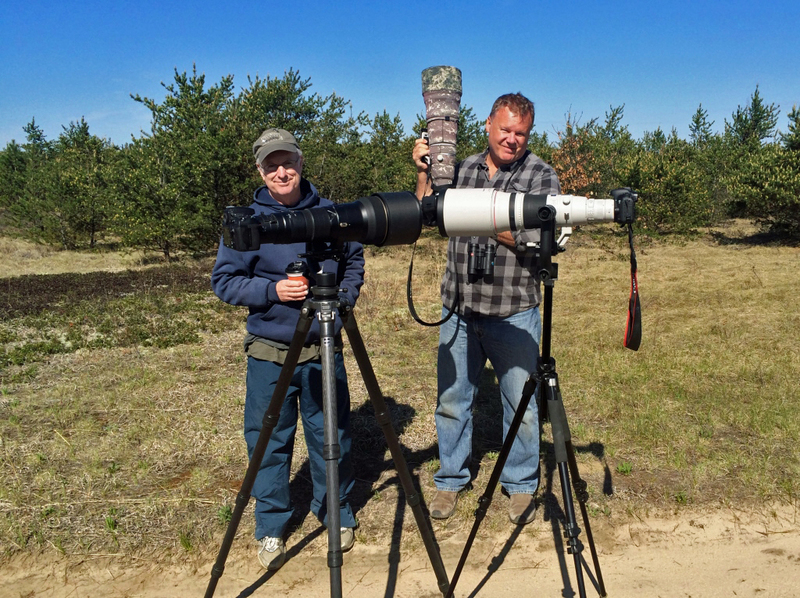 Doug Tallamy (left) and your blogger pose with some heavy artillery in Michigan's jack pine country back on May 30. 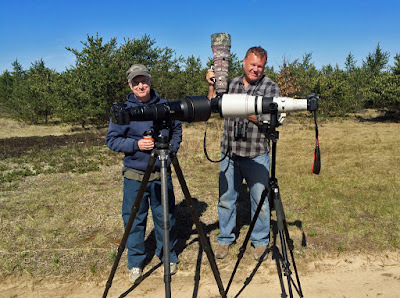 Doug and his buddy John McIntyre came up for a few days prior to my Nettie Bay Lodge tour, and it was my pleasure to show them some of the wonders of northern Michigan. Tallamy is quite the photographer, and if you can make his upcoming talk you'll be able to marvel over some of his handiwork. Doug will be at the Grange Insurance Audubon Center at 505 W. Whittier Street in Columbus next Sunday, June 14. The show starts at 7 pm, and you won't want to miss it. Read Doug's recent op-ed in the New York Times RIGHT HERE. This is Doug's magnum opus, and it is a work of genius. 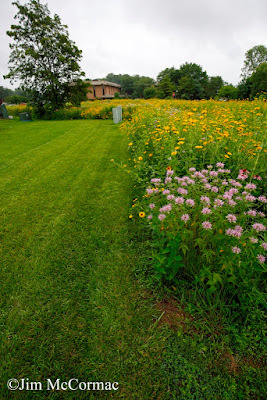 He clearly, logically, and simply puts forth the role that native flora play in the landscape, and how the homeowner can utilize native plants effectively. Most of our native insects are intimately tied to native plants, and those bugs go on to provide fuel for higher beasts such as birds. 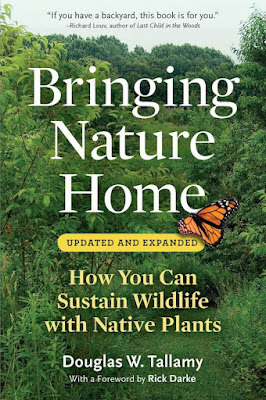 I imagine that they'll have Bringing Nature Home available at the presentation, but CLICK HERE for another option. I've heard Doug speak on numerous occasions and it is ALWAYS a treat. In my view, he is one of the top speakers on the natural history circuit, anywhere. I would HIGHLY recommend this program. 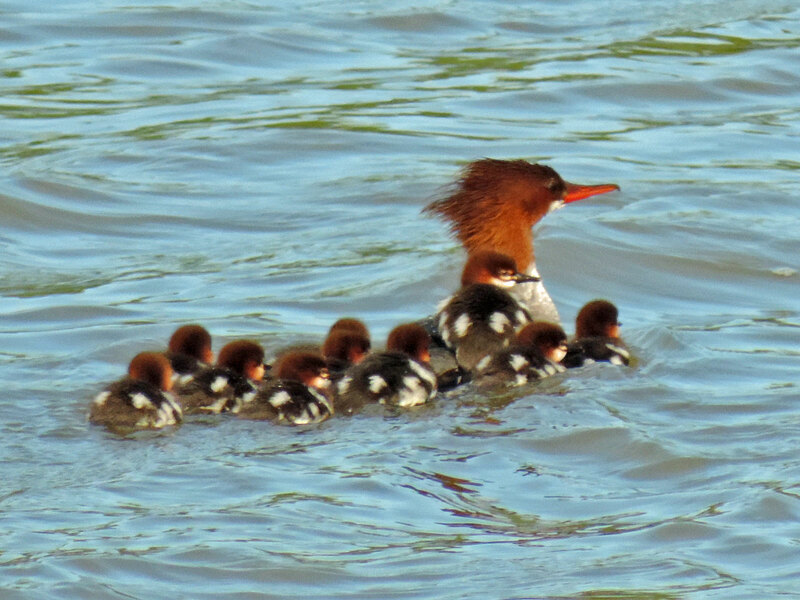 Bob Lane sent along some wonderful photos of a hen Common Merganser attending her large brood of chicks. Looks eleven of the little fuzzballs in all. The little ones stay closely huddled with the hen at this point, even hopping aboard her back for rides when possible. 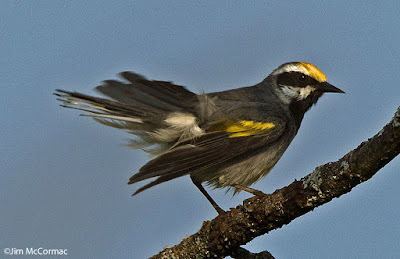 He observed the brood at Conneaut, Ohio, last Tuesday, June 2. They most likely nested along Conneaut Creek, where John Pogacnik and others have reported breeding Common Mergansers for a number of years. This cavity-nesting duck nests along high quality streams buffered by healthy riparian forests. There is no question that this species is on the rise as a nester in Ohio, and adjacent states. Recovery of areas that were once largely denuded of forests is the likely reason for the duck's increase - they are probably recolonizing former breeding areas. West Virginia's breeding Common Merganser population has skyrocketed - I wrote about there RIGHT HERE - and Pennsylvania's population has also spiked enormously. About a decade ago, Jim Dolan, along with Dan Justice, began to place nest boxes along Little Beaver Creek in Columbiana County. Their efforts quickly bore fruit, and boosted the nascent merganser population along that beautiful stream. More on that work HERE. Currently Common Mergansers are nesting along a half-dozen or so streams in eastern and northeastern Ohio, and not coincidentally these waterways rank high among our healthiest aquatic ecosystems. 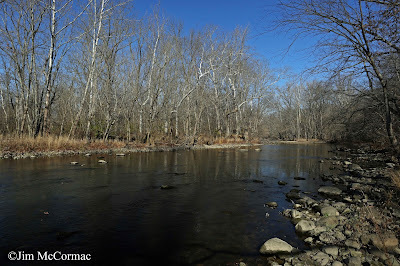 Robust riparian forests that protect the water quality of these streams is a common denominator. 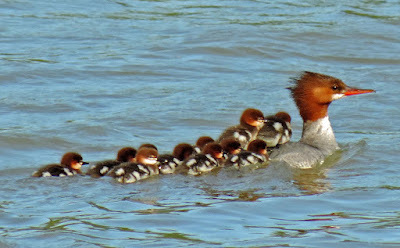 Common Mergansers are a highly visible, charismatic indicator of healthy forests and waterways. Life mammal! A burly burrowing beast! 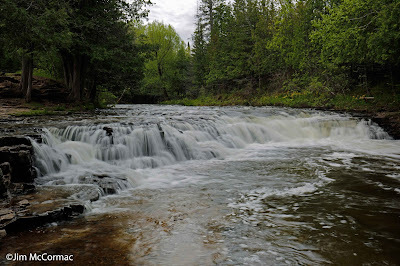 The gorgeous Ocqueoc Falls, just minutes from Nettie Bay Lodge in Presque Isle County, Michigan. These are the largest falls in the Lower Peninsula. I've been coming to Nettie Bay for six years now, to lead small groups of birders in search of, what else, birds. But we find much more, in scenery that often resembles the above in various ways, shapes, and forms. The botany is exceptional, including some neat orchids. Very interesting butterflies work the flowers, and dragonflies of many species abound. And the mammals! More on furbearers in a moment, as they are the primary topic of this post. We haven't yet confirmed next year's dates, but they'll be at the latter end of May. The beauty of late May, for those of us from down south, is that we can relive spring migration again. Even in late May big scrums of migrant warblers and other songbirds can be encountered along Lake Huron, and on one magical day this year, we observed nearly 500 raptors moving northward along the shore of that Great Lake, nearly all of them Broad-winged Hawks. We keep the group size small - about ten people - so that everyone can pretty well see everything. The general arrangement is to arrive in the afternoon the first day, dinner followed by local birding, then three days of major action. The fifth and final day ends at noon, after spending the morning chasing down some more interesting birds that were perhaps missed, followed by a brunch before departure. Mark and Jackie Schuler are proprietors of Nettie Bay Lodge and nicer people you'll not meet. As an exceptional bonus, Jackie is a topnotch gourmet chef, and you'll never eat better on an outing like this. Just ask anyone who has been. The lodge and its attendant cabins are hard on the shore of a large glacial lake that sports several pairs of nesting Common Loons, which are prone to delivering loud yodels on occasion throughout the night. No one complains. If you're interested in coming next year, we'd love to have you. Just contact Jackie or Mark, RIGHT HERE. They had just had beautiful extended views of this animal, a Golden-winged Warbler. Actually, one like it - I found over a half dozen territorial males, and this bird, caught during a preening session, was one of the others. 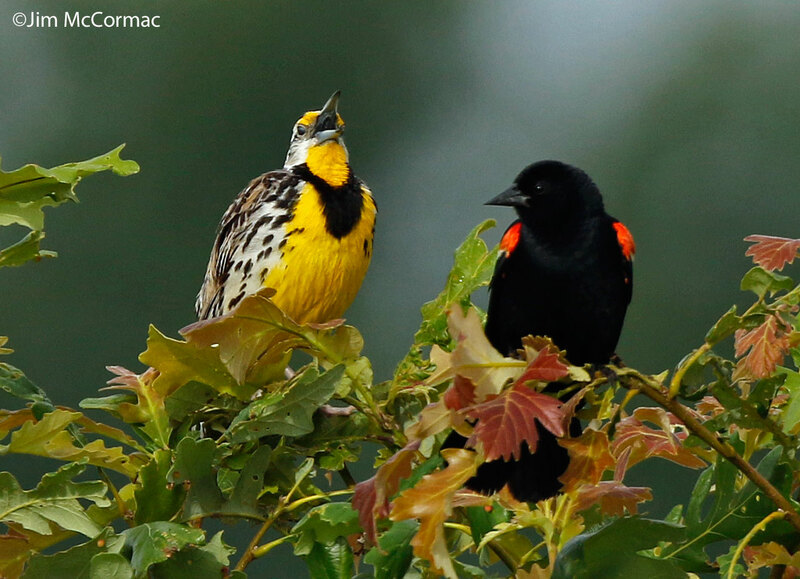 Golden-wings are major target birds for most people who come, and finding them isn't too tough. 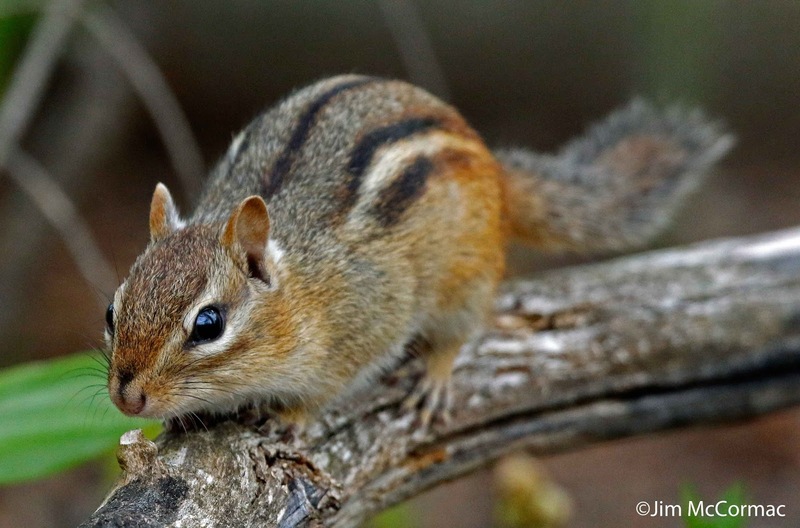 Presque Isle County is awash with mammals, and few are more common than Chipmunks. Or more important - the striped chubby-cheeks are MAJOR dispersers of tree fruit and other seeds. 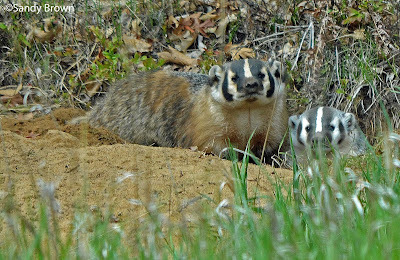 In addition, we always see Muskrat, Beaver, Porcupine (usually, but always their dens), several species of squirrel, Thirteen-lined Ground Squirrel (which is essentially a prairie dog), White-tailed Deer, and more. But one mammal in particular has always eluded your narrator, both in my five previous years of Nettie Bay trips, and elsewhere. 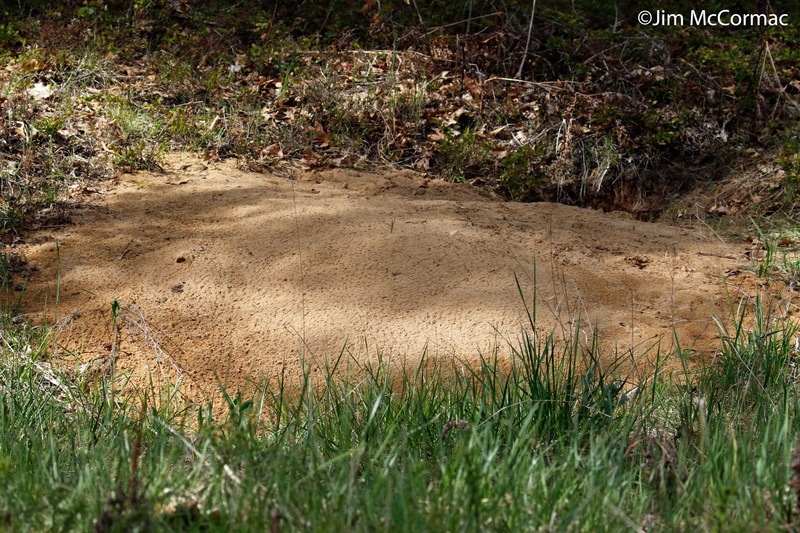 Soon after my inaugural visit to Presque Isle County, I noticed burrows like this. 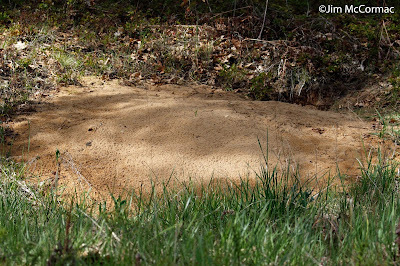 This part of Michigan is sand country, and the big burrows typically have large porches of excavated silica out front. I knew immediately what was making them, although a local deputy sheriff assured me that they were the handiwork of Red Fox. Ha! I knew better than that, and have spent many hours observing burrows that looked to be active. As the presumed occupants are mostly nocturnal, I even skulked about near burrows in the nighttime forest, hoping to see what for me was a beast approaching mythical status. It's funny, sometimes, how one finally vanquishes a nemesis animal. Maybe, if it is some bird that you've always lusted for, it shows up at your backyard feeder. Or a desired butterfly alights on your arm, after years of failing to see one. In this case, the Glory Hallelujah moment took place in a 15-passenger van as it plodded down a backwoods sandy track. 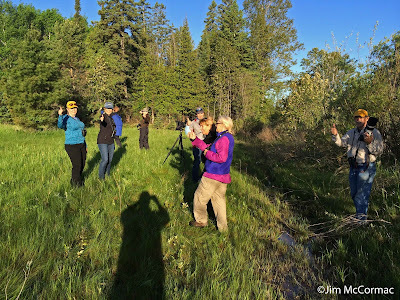 It was near day's end, and our group was tired, having met at 5:30 am and spent much of the day finding Kirtland's Warblers and other great stuff. We were headed back for one of Jackie's delicious dinners, when suddenly a SHOUT WENT UP! BADGER!!! Shouted Jenny Bowman and Sandy Brown in tandem, along with perhaps others. STOP! Was the next cry, from me. Mark notched the van into reverse, and eased backwards. There, big as life and peering curiously at our conveyance and the strange bipeds within was this big, beautiful badger! We quickly settled down, and took full advantage of this rare opportunity to ogle a seldom-seen mammal. The den was only ten or so feet off the road, which is how they commonly are found up here. A BABY BADGER!!! It wasn't but a few seconds or so and a smaller paler version of the big one pushed its way from the lair and stared at us. 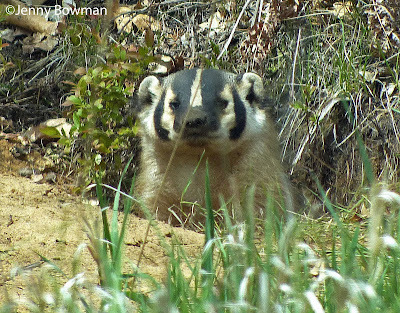 The youngster seemed curious indeed about us, but momma badger was having none of it. She seemed to attempt to prod it back down the hole, but the inquisitive youngster resisted for a bit, giving us brief but fantastic looks. After perhaps a minute or two, the mother succeeded in herding junior down the hole, and then went subterranean herself. Immediately after the adult Badger disappeared, large clouds of sand came flying out from the hole. At first, not knowing much of the ways of these beasts, I wondered why she would pick such a time to do further excavations to the den. Well, that's not what she was doing at all. Jenny's video above shows her sand-pitching activities. I went back later that evening, towards dusk, with Mark, and we ever so silently approached the den. Only to quickly discover the reason for her sand-flinging. She was temporarily covering the burrow entrance, after apparently perceiving our presence as a threat. I went back the following day, and she had opened the hole back up and reshaped it to perfection. 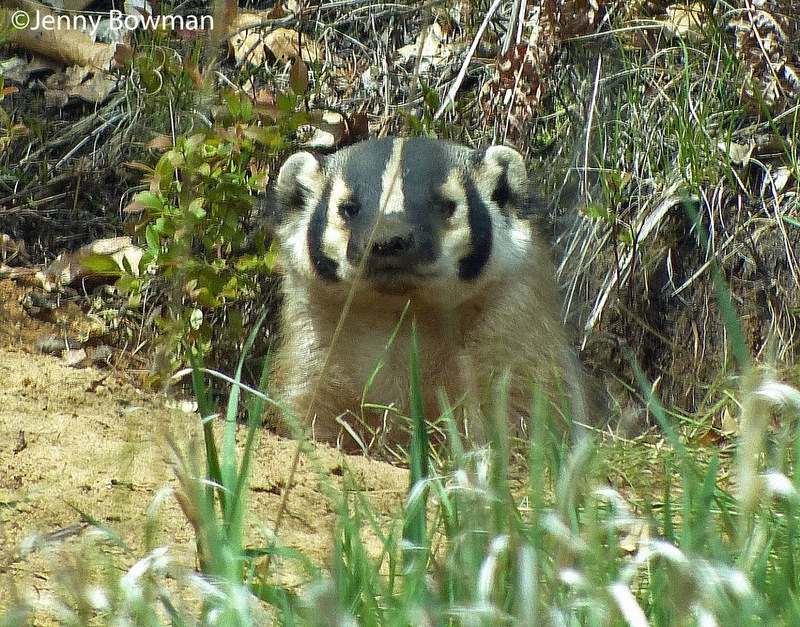 Badgers, as we've seen, are efficient diggers and their primary prey are lesser animals such as ground squirrels, moles, mice, chipmunks etc. which they rapidly unearth from their burrows. 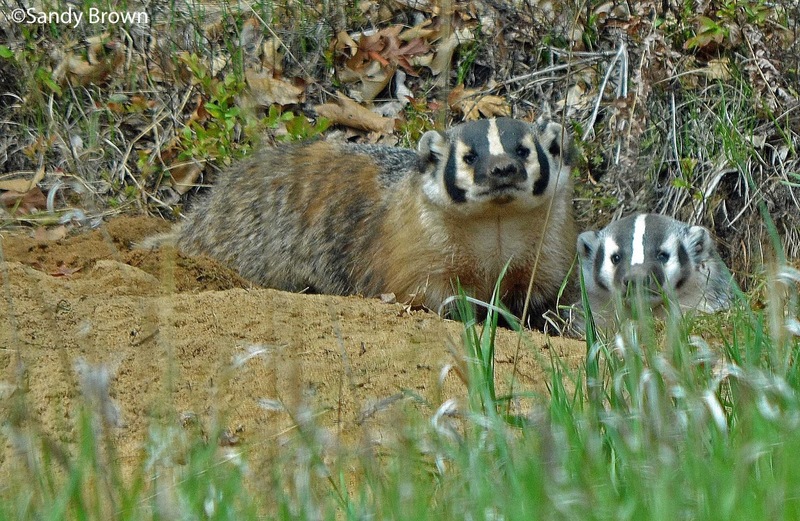 Badgers are primarily western in distribution, with Michigan being near their eastern limits. For more about these fascinating mammals, GO HERE. Thanks very much to Jenny Bowman and Sandy Brown for allowing me the use of their photos, and video. This was the one day in probably years that I DID NOT bring a camera along. I had been carting along the Canon 7D Mark II with the stellar new 100-400 lens bolted on, just in case anything major happened. But one can not - or at least should not - focus on photography when leading groups. And that morning dawned rainy, and only a week or so before I had been in the rain with my other camera and the moisture gummed it up a bit. So foolishly I was sans camera, figuring hey, what could happen if I didn't cart one along for one day. I'll long kick myself over the Badger shots that I would have had. But Jenny's and Sandy's are quite nice, and besides, the memory of this major mammalian moment will always be with me, and everyone else who was there.